The very first RCMP wife I met, who was actually a soon to be ex-RCMP wife, scared the crap out of me. She cornered me at a party, after finding out my long time boyfriend was heading to depot, and told me what to expect living this ‘life’. "Never expect him home when he said he would be, his devotion to his work will trump all else, and his personality will slowly change after years of wearing the serge." In her desperate attempts to understand her husband’s ‘life’ she even went through depot and became a member herself. While she loved her career, she mourned her marriage that was now beyond repair. My initial thoughts were… there is no bloody way I am going through depot. Are you kidding? Those pants are ill fitting, my hair is best showcased down, and I don’t really like being told what to do. Since I knew that was out of the question, I kept that conversation in the back of my head as I watched him go through depot, while I supported from the sidelines. Unlike most spouses, I was also in Regina at the same time, and had the opportunity to get to know many of his troop mates, and had a few crash at my apartment on the weekends. (It didn’t hurt that I had a pretty roommate, either..). I saw up close what the intense schedule did to the men and women that I had befriended on the weekends, and saw them slip into another world during the week. In my estimate, people did some strange, and incredibly out of character things, under pressure. Mostly, as the 21 year old University student, I was just happy to have a solid group to party with on the weekends. Well, the partying came to a crashing halt when I realized I was pregnant with a depot baby. By his graduation, I was finishing up my degree, 3 months pregnant, about to move to a small town where we would reside in the attached house to the detachment. Oh yes, and I was 22. Definitely ready to take care of the flower beds, giant lawn, and detachment yard with a newborn, in the first house we had ever lived in, in front of the whole town. There were ups and downs, moments I would like to forget, and moments I will remember forever, but mostly we were embraced by this small town like one of their own. But... there was a change in him, and I could see it was not an easy adjustment for him to go from police officer, to husband and father, in the time it takes to walk through the door. The easy going, hard-to-anger husband I had once had, now seemed to be kinda irritable, and wasn’t always the nicest person to have around. I lay awake at night wondering, did I really just move 11 hours away from my parents, with a terribly colicky newborn, to stay at home and be a doting wife and mother, after working hard (well at some points anyway) to earn a degree I would never use? Did I really do this to have a grumpy, condescending husband come home from work? We had some moments when I thought that woman had been right. He had changed and I didn’t know what to do with the guy in front of me. But, we kept talking, and he kept trying to figure out how to be one person all day long, and then come home and relax with his family. We slowly worked through it, and I took a suitcase out only once... in dramatic flair, to show how much he had really pissed me off. As a young RCMP wife, nobody really told me about the disappointment of eating dinners alone with the kids, when you cooked all day, but he can’t get away from work. Or, when he gets called out Christmas morning. Or bringing home your baby from the hospital and having him go back to nights for 15 in a row. How to deal with the inevitable moments when you feel angry, and frustrated, that you somehow ended up so far away from what you thought your future would look like, while he is off living his dream. Or, how to deal with the look on his face after doing a next of kin notification to a young family, because he could hear the kids crying as he walked to his car. As a wife of a new officer you feel like part-psychologist, part-wife. Always trying to read moods as they walk in the door. Trying to hear something in their voice that will tell you how bad the day has been, when they just called to say they will be late.. again. Knowing when to ask questions, and when to just leave them alone. It’s so confusing to walk through life with someone that feels a bit like a stranger, watching them experience death and darkness, and not knowing what to say. What I’m getting at, is that I was beginning to see that this ‘life’ she had talked about, wasn’t all it was cracked up to be. She was right. They change. But what she forgot, perhaps in her bitterness, is that it’s not necessarily a change for the worse, and the person that comes out on the other side is definitely worth fighting.. well with. Getting to the place where work is somewhere they work hard, have some fun, and bond with their coworkers. Where home is somewhere to laugh, and relax, and have loving, meaningful, relationships with family. In following his career, we’ve been rural, then on a reserve at an LDP, and now in a city close to a big center. His work schedule has been all over the place, and the level of stress has been different in every post. Where we are now, at least there is a chance of anonymity, we can go into the city and no one knows who he is. Holidays really are days off, and with not much on call, his phone doesn’t ring 24 hours a day. (Sidenote- The one benefit of being accustomed to being woken up at least once a night, is I no longer dread middle of the night phonecalls.. I just assume it’s work!). He still works hard, and still doesn’t make it home a lot of the time when he says he will, but there is an ebb and flow to our life. Some of it was the change in location, but a lot of it was the ability for the two of us to adapt to this lifestyle. Having three children, and the ever present possibility of ‘transfer’ looming overhead means that in this profession he has chosen, we really only have each other. His work will take him places, that’s what he signed up for. I have signed up to be supportive, and while I refuse to leave my own aspirations behind, as part of a team, I will follow. The thing is, a lot of time the anger is when people talk about the ‘life’ they, our RCMP spouses, have chosen for us. I began to realize that’s where they got it all wrong. No matter your profession, as soon as it’s your ‘life’, well that's a problem. And if someone else is choosing your life.. well, you might have some deeper issues than what they do for a living. This profession has the ability to give a life style to the members, and their families along with them. The ‘life’ we have chosen is one where we are ready for the next adventure, lucky to have friends spread across the country, with the opportunity to take our kids to new provinces, to share rare experiences. But most importantly, this is a ‘life’ we are choosing to live together. I have met couples who have lived through years of this career, who have come out on the other side blessed with the memories they have made, unable to count all the postings they have been. And.. of course, we have all seen the other side. It would seem there are lessons to be learned from both outcomes. We certainly don’t have it figured out yet. We are 15 years into our relationship and only 7 into this crazy career, and it feels like we still have to find new ways to make this career work for our life. I can’t say where our next stop will be, but god-willing, and plenty of hard work later, it will be together. You have the right attitude and you will both be okay. Never stop talking to one another. Besides love, the other most important words for any marriage are trust, understanding and compromise. I am the mom of an RCMP wife. High level of hypocrisy amongst the public we served and within the RCMP. I have seen some beautiful things and other things I wish I could forget. I have filtered many of these so as to not burden my spouse. My marriage is strong as I have never stopped loving her and when she became angry I always tried to see things from her point of view. This helped me understand why she felt the way she did and also helped me communicate with her. This has saved our marriage. I will be the first to say its been tough but worth it. I am now working in an isolated post alone thousands of miles from home for the next few years. Parole every six months. We still talk daily and work together to solve the speed bumps of life. It's not perfect but it works. Still in love. My skin is a little thicker now. If your in love then it will always work out with compromise. As an RCMP wife, its always so humbling knowing....you are not the only one! Thank you! And yes, I two have pulled the suitcase out...but with of lesser dramatic value as DH received a phone call of a shooting and I was forced to tell him I love him, and give him a gun just incase the worst case scenario were to evolve. Say hello to my troopmate ! Hope everything is well with both of you. Great article, but most of us were not at depot with our husbands or boyfriends. I have yet to read a story about what really happens there, what they do without their wives or girlfriends. My husband met a female troop mate there, and it has ruined our relationship since he left depot. So in short, I am experiencing everything you are, plus the added baggage of a depot affair. I'm sorry to hear about what happened to you when your husband was at Depot. While this isn't an isolated occurance, and Depot can sometimes be a "frat house" mentality for some people, there are many cadets that go through Depot and remain faithful to their wives/girlfriends. I think Depot can be the reason for many changes within a person, but the choice to remain faithful to your loved one has more to do with a person's character than what is happening at Depot. If your husband had an affair at depot you should have walked out the door on him and they should have kicked him out. It isnt what "they" get up to at depot. Its what your husband did. Not what the rest of us did.And he'll do it again. I agree I should have walked out, and I also agree cadets who cheat on their spouses should be kicked out. But can you honestly say this has not happened before? I have been told it happens a lot at depot. Thank you for posting this, this is what I needed to hear, as a girlfriend on the eve of our first transfer, I am finding that my career is going to be finished, and I will be looking for different work, my degree will be useless and I will be spending a lot of time alone while he is working late and on call. I love him very much and am very independent and looking for an adventure, hopefully starting a family soon. Thanks again. Left my career and my familly behind! I will not lie it's been tough but....... full of adeventure! Glad you worked through it. I am a former member myself and I thought Depot was great. It changed me as a person, how I saw myself, what I was able to accomplish etc etc. But after being posted to a small town halfway across the country, despite being single, I just couldn't do it. It's a ridiculously hard career choice. I thought I was a Mountie, turned out that I wasn't but don't regret any of it at all as it has made me a stronger person. I'm sure your husband has told you many times that "you just don't understand." and I'm sorry but this is probably true. You can't understand the things mounties go through on a daily basis, not truly. It was too much for me and breaking me mentally so I had to get out. Best of luck with your future!! I am a "RCMP" brat. My Dad retired after 38 years with the Force, 28 years of those were with counter-intelligence. I think the good outweighed the bad, and I loved my extended RCMP family- we're all really close to this day. My Dad would be the first to admit that without the quiet strength of my mother his success within the Force wouldn't have been possible. I admire both of my parents greatly. LOVE LOVE LOVE this post! I could not have said it better. When my husband went to depot our daughter was 23 months and son was born 11 days into training. His goal was to go to depot, fly under the radar, get through training and come home - where ever our new "home" would be. His troop flew him home for a 24hr visit to meet our son....no questions asked, no repayment. They were an amazing bunch - yes the "Young and the Restless" occurs in every troop. But you are very right when saying nobody prepares us for this lifestyle. I was fortunate enough to have an amazing "Watch Mom" (watch commanders wife) who would contact us after a terrible file and ask how we are doing. Years later my husband was acting detachment commander in an LDP, he called to let me know they had a horrible file and would need to feed his guys (4 plus the memebrs who would arrive shortly) and after putting a ham in the oven, while peeling potatoes it was MY turn to make that phone call to the 2 young wives in our detachment. We may never be prepared, but we can ALWAYS support each other, happy news, sad news, stressed out and ready to pack a suitcase news.....no one will EVER "get" our adventurous life - but with our ever-growing "family" we sure can work together to make it the best we can! For those of you that worry that Depot is a frat house, where fine men and women come from across the country to cheat on their spouses, you need not worry. The training environment is so demanding Cadets hardly have time for themselves. I would suggest that the current rates of infidelity ( some studies show as high as 40% ) are no different at Depot then anywhere else. If you are worried that your spouse/partner will stray in this environment then you should reconsider your relationship whether they are chosen for Depot or not. Good post!! Many probably wish they would have reconsidered. So if they are 15 years into their relationship and 7 years into his caree, but he graduated Depot when she was 22 .... that means she was 14 when they started their relations ??? Thank You for your honest publication Brittany. You have said a great deal and I know this is speaking the hearts of many. I am a retired RCMP member after 35 years of service. My wife and I have been involved in Marriage conference speaking to police members in Canada and abroad. Our web page www.supportthebadge.ca is presently down for repairs. We also developed a DVD called "Bonded" which deals with 4 pillars of marriage for Police Couples. I would truly like to get in touch with you. Very well said, Brittany. At the end of the day, us 'wives' get to choose how we respond to the events of our lives and how they at times can unravel before our eyes. But we are proud of the accomplishments and sacrifices that our husbands make. My husband as you know made a decision to become an RCMP officer at the age of 47, married 27 years and leaving 3 children 2 provinces away, many family and friends, I had no idea how hard this would be. Thank You so much for writing this heart-felt blog. It validates what so many many others are going through. From one of the frenchies of the troop. Obviously this life is NOT for you. I am happily married to an RCMP member for 10 years now. Alot of my friends are wives to members and also have a wonderful life. The first thing is that you should have NOT listened to an EX-rcmp wife. You should surround yourself and take advise from wives who are happily married to an RCMP officer. You should be proud. Being negative will only make an unhappy life. Good luck and hopefully you can surround yourself with positive and proud wives. This comment has truly confused me. I read it a few times, and then reread my post trying to see what you, so obviously, did. I thank you for the suggestion to become more positive, but to be honest, your comments have come off quite negatively. I understand that tone can be subtle, so let me be clear that this is a love letter to the life we have chosen. The comments I have gotten from around the country, both members and non, speak to the truth they have found in what I wrote. I can see you did not find this post true to your life.. But please don't infer that this is anything less than a post, albeit honest, about how thankful and proud we are to live this lifestyle. To anonymous..I am not sure if you have even read her blog. If this life is for anyone it is her. She discusses how they have worked together through everything -since they were teenagers. She discusses how they have created a life together. I have only met this girl a few times, but she is anything but negative. Her blog is inspiring. She writes about a wonderful life her and her husband have creative. I have no idea where you would see anything negative!! Agreed Renae... 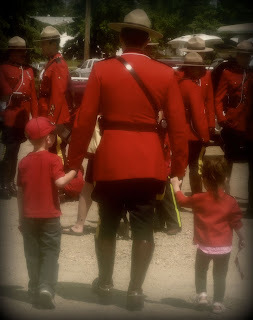 I'm also a proud RCMP wife who has, at times, found the lifestyle difficult, challenging, and just plain hard. I think anyone married 13 years can say that about their relationship, but throw in the added stress the job brings into our lives and I think we have to struggle to find happiness at times. Every member has a different experience and to say "Obviously this life is NOT for you" is very judgemental and really sort of mean. We should stick together and support one another so that we have people to fall back on when things are hard and to laugh with when we are though the hard times. THAT is what the RCMP is about. We have been married for 15 years, and my husband a member for 10. We chose the RCMP life together and embrace it, the moving. I like how you said it is not something someone else has done to your life - it IS your life. Depot does have a high rate of cheating - it is a false environment with a group of people living 24/7 together. They are told what to wear, what to eat, when to eat it, and when to change their clothes - there is not a lot of room for independent thought. But if you have a great relationship to begin with - all is good. I enjoyed reading your post and see the similarities to being an army wife. The dinners alone, missed birthdays, Christmas, family events, etc. I agree this lifestyle is not for everyone and agree if you have good relationship with good communication it does work. And it also sounds like the rcmp family is similar to my military family. There are times when it is tought but We all stick together and I wouldnt change our life for anything. Sending love from one RCMP spouse to another. Thank you for a great read. As I am becoming a RCMP wife shortly, I have been living the life for the past year. Luckily, my job transfers as easily as his, and I am more then excited to experience the wonderful country with him. As with anything, there are nerves, bad days, and good. Each day I learn more about my man and how he deals with everything that is thrown his way. We have the amazing fortune to be Ina larger community, surrounded by great members. Since I am 9 hours away from my home, the family I have adopted this past year has been amazing and supportive. I thank you for your post, as it is encouraging while start my life with my Mountie. I'm a normal, average girl trying to survive motherhood, wife-hood (is that a word?? )and life with good humour, fantastic friends and family, and God willing.. good looks. So pull up a chair, pour a glass of wine, and laugh along with me as I share too much information.